Today I marveled at the things that the internet allows me to do. I realized that I forgot to send the original file of a photo I had taken of Earth, Wind and Fire to a friend who was invited to a meet and greet with the band. I was at work and the photo was on my external hard drive back at my apartment. This was the first opportunity I’ve had to have a photo I’ve taken signed. Thinking quickly, I remembered that I could download the photo from Flickr. My friend wasn’t sure how to go about getting the photo printed. Rather than leaving it up to him (which I knew would result in the photo not getting printed), I used the Walgreens website to have the pictures printed in Austin, TX and ready for him to pick up in an hour. 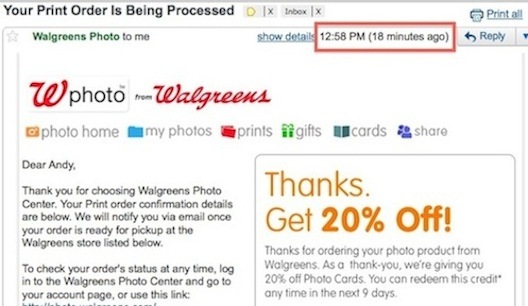 If only the Walgreens autoresponder campaign that my purchase triggered was as on point. First, I was surprised that I didn’t receive a welcome email when I signed up for an account on the Walgreens website. I didn’t even get a confirmation email telling me my purchase went through. This worried me, so I left the browser window open that confirmed my purchase. 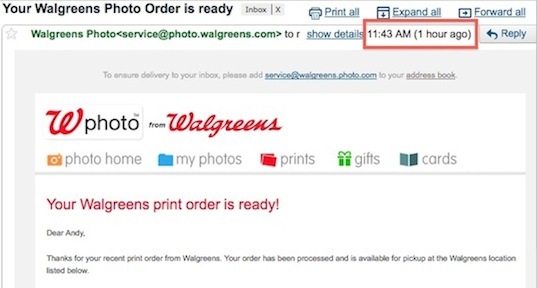 I finally received an email from Walgreens informing me that my photos were ready. That provided some relief and I forwarded the email to my friend so he would know to go pick them up. Should be the end of the story, right? Over an hour after receiving an email that my photos were ready, I received another email. This one was informing me that my order was being processed. This was the email I should have received when I first ordered the prints. Except since it came so late, I started to worry that it didn’t all go right. I was concerned the photos weren’t going to be ready on time and that my friend wouldn’t be able to get them before leaving for the meet and greet. Don’t send your subscribers into a panic. Make sure your autoresponder campaigns are sequenced properly and that your system is sending them out as planned. Otherwise, even though everything went according to plan, you may cause some unnecessary worry. At least I can’t be the only neurotic one that would have reacted this way. Right? RIGHT?!? !